A cat adopted every other day! With a total of 186 adoptions for full year 2018, a cat found a forever home approximately every other day, with January high of 25 and December low of 8. We are looking forward to another great year for adoptions with our new partnership with The Cat Tales Cat Café. Do Markings and Age Impact the Likelihood of Adoption? Anecdotal evidence suggests markings and age of a cat impact the likelihood of adoption, but is this true? 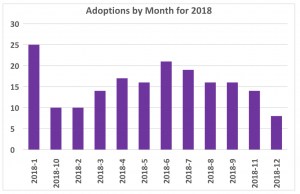 Using adoption information from February 2018 to March 2019, the monthly rate of adoption by age and color group can be calculated to answer this question. During this time period, our adopters loved Calico! Calico had a monthly adoption rate of 6.8%, compared to 2.6% for Tuxedo and 2.0% for Black. So yes, markings and age do impact likelihood of adoption!